Our products help you to supply your body with vital nutrients - for a healthy and sustainable life. They are full of valuable natural ingredients from controlled cultivation and are suitable for a vegan lifestyle. hajoona team partners decide for themselves when and how much they work to achieve their goals. We help them develop their personality and unfold their full potential. Join us and celebrate your first successes with us soon! hajoona has always stood for unique products in combination with innovative marketing concepts. We offer the ideal basis for everyone to lead a self-determined, healthy and sustainable life in perfect balance. With our Personnel-Franchise concept, everyone has the chance to build up their own business without taking any risk. Green Coffee with Ling Zhi, Maitake, Acai, proteins & more... h-SUN + is not only a revolutionary product! Keep your figure in mind and use it as your ideal companion for the positive start into the day - or just in between! With juices and herbs from controlled organic farming, vitamins and natural sea minerals. The aronia berry, the main ingredient of h-ONE+, is known for its high flavonoid, folic acid, vitamin K and vitamin C content. 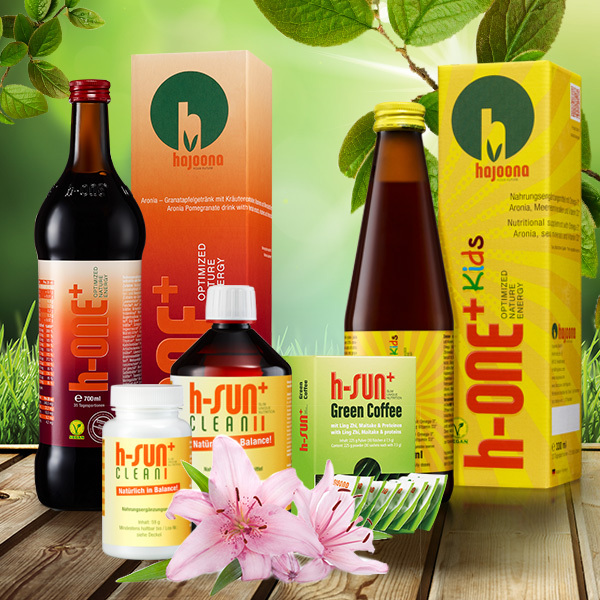 h-ONE+ kids is the only product for children that combines natural organic ingredients with vitamins, minerals, vitamin D3 and Omega 3 from vegan sources - the best for our loved ones. Purge your bowel for 14 days with h-SUN clean I. Within the further 14 days, we recommend the targeted structure of the bowel with a combination of prebiotic and probiotic ingredients included in h-SUN clean II. h-SUN+ is responsible for detoxing the body and accelerate the fat metabolism to help you on your way to lose weight. h-ONE+ progressively fills-up the cells with relevant and necessary vitamins and nutrients. A best in one concept for your health. Without any seperated vitamins in pills and easy to handle. Naturally fit. To prepare the body and especially the gut for the absorption of the nutrients we recommend a cure with the products h-SUN clean I and II. They clean the gut flora and prepare it to adopt the valuable nutrients. Nutrient supply at ist best.